I expect you've all seen pictures of this particular model many many times before, but as a newcomer I'd appreciate any comments from all you much more experienced card modellers out there. I may be new to card modelling, but not to aircraft modelling in general, as I usually build the traditional balsa 'stick & tissue' models. 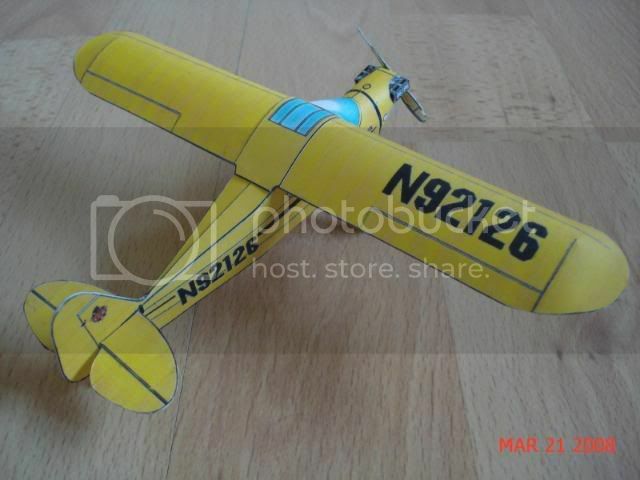 You can see my work here http://www.virtualaerodrome.com/user_ha ... ser_id=203. 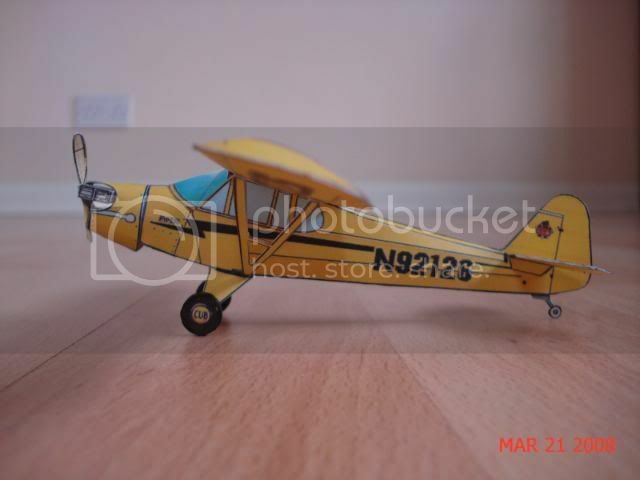 Just click on an image of a model and you will then be shown more photos of that particular aircraft. I will still probably continue to build this type of model, but I'm also looking forward to making LOTS more Fiddlers Green ones too! Last edited by cdwheatley on Sun Apr 20, 2008 5:39 am, edited 2 times in total. Welcom to the forum Chris! :D thats a good lookin' cub ya built, what did you use for wheels? Wecome aboard, Chris! I hope you enjoy this forum Nice and clear build, btw! Welcome Chris. Great job you did with the Cub. And those stick & tissue planes are awesome. Last edited by cdwheatley on Fri Mar 21, 2008 2:25 pm, edited 1 time in total. WWII, the wheels are just the ones included on the Cub .pdf file, the edges painted over with acrylics using a small brush. What do you all use for colouring the edges of your card models?! july1772, I'm glad you liked my stick & tissue models too . Last edited by cdwheatley on Fri Mar 21, 2008 2:24 pm, edited 1 time in total. Last edited by possm_23 on Wed Mar 26, 2008 1:03 pm, edited 1 time in total. more here http://s292.photobucket.com/albums/mm32 ... reen/SE5a/. It's only my second card model, but already I'm hooked! Last edited by cdwheatley on Fri May 30, 2008 5:43 pm, edited 3 times in total. Well, Chris, it appears you're a natural card modeler. That biplane looks great. I'm certainly looking forward to seeing your future builds. Great looking SE5a, Chris I love this plane! Nice to build and very atractive project. I did both colour versions before time in WSAM. What scale you use? Last edited by OldMan on Thu Mar 27, 2008 1:42 pm, edited 1 time in total. OldMan, I'm not sure what scale my SE5a is, but it is the 'LARGE' version. 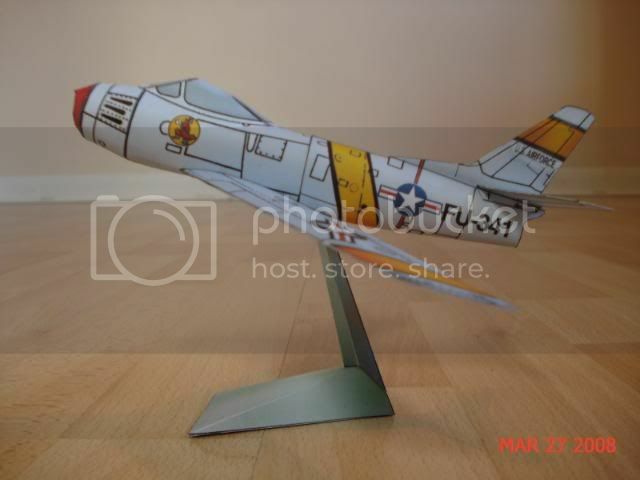 more pictures here http://s292.photobucket.com/albums/mm32 ... 6%20Sabre/. 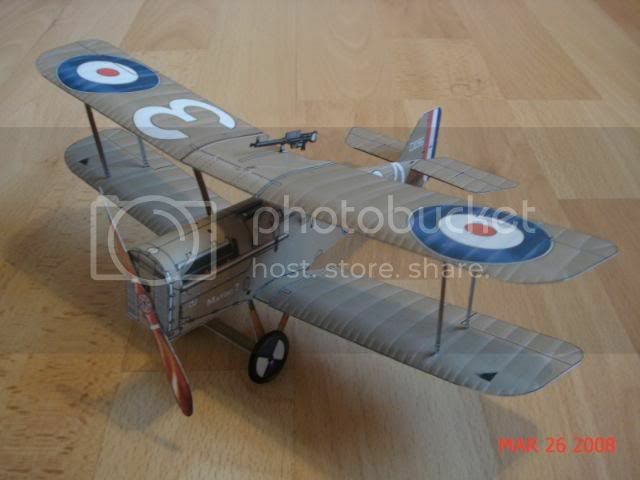 I must say I was a little apprehensive as to how this one would go together as it's a fairly old model and somewhat less 'polished', at least compared to the SE5a I've just built (no disrespect at all intended to Chip or Fiddlers Green in general). However, I was pleasantly surprised at how well everything fitted, and I was able to complete it in just a single afternoon/evening . Last edited by cdwheatley on Fri May 30, 2008 5:42 pm, edited 5 times in total. good job on the F-86! 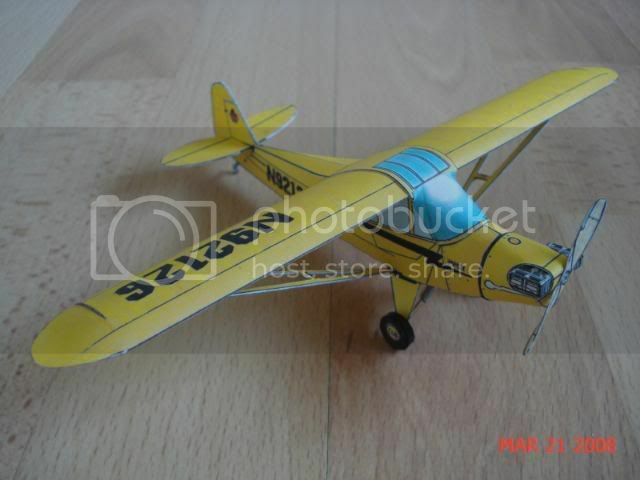 :D that plane is now on my to build list!